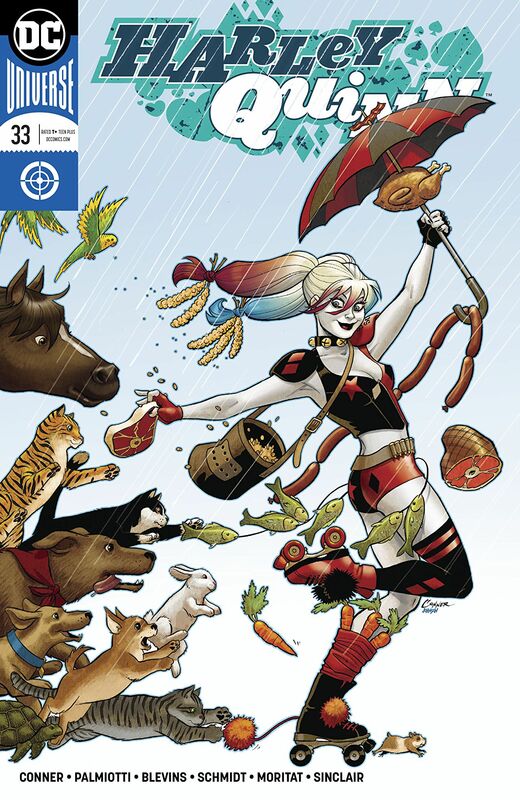 Harley Quinn #33 Review – AiPT! Jimmy Palmiotti and Amanda Conner’s legendary run on the character comes to an end. Delightful chaos is the theme of the day as one, too brief, moment in the life of Harley Quinn begins to wrap and another part of her journey begins. Another brief flirtation with a life that could be mixed with one that could have been. All of us, readers and characters alike, are entering a period of transition and that always comes with a price. While we readers have seen beloved creators come and go, I’m not sure that Harley has experienced this level of loss in her life. How she deals with it is key to understanding the future of our favorite roller-derbying, bad guy-slamming jongleur. Let’s look, for a moment, at the grief Harley and the crew are dealing with. In a rarity for comics, the death of Mason Macabre had significant impact on every major character without having the world-shaking weight that leads some to be resurrected *cough*JeanGrey*cough*. Mason meant a great deal to Harley, Madame Macabre, and the entire Coney Island gang, but not much beyond. While that may seem to belittle him, I think it focuses on a much more human place than the death of a Superman. Opening in the graveyard during a literal hurricane is a bit of symbolic overkill, but I’ll take it. Everyone deals with grief in their own way. Ivy offers her companionship to aid Harley, showing her love and devotion, while Harley tries to be strong for Madame Macabre. While Harley is firmly in stage 4 of the grief cycle (denial, anger, bargaining, depression, and acceptance), Madame is languishing in denial, choosing to leave and remember Mason’s few happy days rather than deal with reality. After an odd (even for Harley) stint attracting the stray animals of Coney Island into her apartment by wearing Lady Gaga levels of meat and veg, we’re back on the roller derby track for a singles bout against a new competitor who can charm anyone with a word. We do get to see gloriously pansexual Harley Quinn in her admiration of Victoria Fit’s sparkling “ta-tas” (blame Conner and Palmioti for that one, not me). After wrapping things up with the Kwinns, it’s time for a road trip, taking Harley, Ivy, and a few others out of grief-soaked Coney Island for, what seems like, a last bit of fun before the end. While I hope Harley Quinn gets back to her madcap antics, I hope that as the book transitions to its new creative team that we see a continuation of the Harley/Ivy dynamic and the real depths of emotional connection that have made Harley such a beloved character. My only quibbling with this issue is the jarring jumps between each micro-story, accompanied by the three different interior artists. Each is good in their own right, but consistency is not the strong point of this issue. As is evident from my reviews, I adore Harley as a character and have loved Conner and Palmiotti’s run immensely. I will certainly miss their work, but am hopeful that the legacy they’ve created will continue well into the future. As is evident from my reviews, I adore Harley as a character and have loved Conner and Palmiotti's run immensely. I will certainly miss their work, but am hopeful that the legacy they've created will continue well into the future.